Ladooo is best android application for earning free mobile recharges. Now ladooo is giving 88 rs for every referred friend. 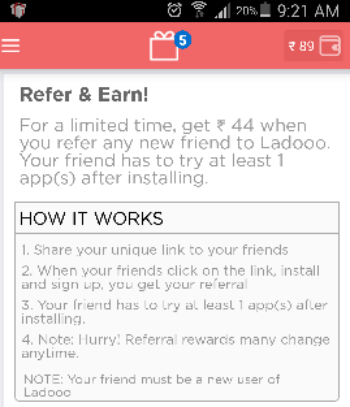 Note:- Invited friend must try at least 2 app after downloading ladooo via your referral link. Click here to download Ladooo and start earning 44 rs. Hurry up!! Offer is valid for limited time!! 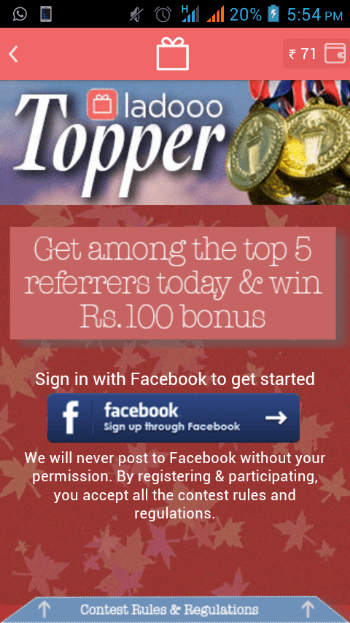 (EXPIRED) Here is new offer called Ladooo Topper which will let you earn free recharge worth 100 Rs. 1) Download Ladooo from Google play. 2) Open it and select first offer as shown in screenshot. 3) Connect your account with Facebook and start referring your friend. 4) One with highest referral will get 100 Rs Free Mobile Recharge. Be the highest earner this Christmas (18-24 December) and win iPhone 6. In my ladooo app, ‘claim share’ option is not there and I referred my friends & they also installed the apps but money was not credited. Hey Sudhakar, please update your ladooo app to latest version. You will find “claim” option there. I didn’t got referral money. It says that your friend downloaded app from another link. Dear admin, I have shared the app and my friend installed it. But I haven’t received bonus 44 rs bonus. Hey Harshit, we do have one solution for this. Just open your ladooo app and select ‘claim share reward’ option from left sidebar. Put your friend’s mobile number using which he has opened account. You will get your earnings. Admin how to logout from ladooo account? There is no need to log out. In fact, you can’t do this. Ladooo is good app. 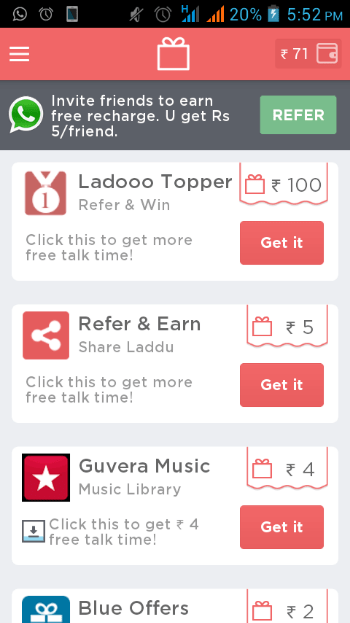 Please send ladoo redeem coupon code. That is absolutely ok buddy. dawnload app & get rs50 recharge free talktime.